Bilbao is the gateway to the fascinating Basque region that straddles the mountainous border between Spain and France. Located south of the Bay of Biscay, it is the capital city of the province of Biscay and one of the most buzzing hubs for a tour of the Basque country by RV rental, campervan hire or Bilbao motorhome rental. While not immediately apparent because of its industrial roots, ‘Botxo’ (or Hole, as it’s called by the locals) has matured to become a major European art center thanks to the modernist Guggenheim Museum. Spain is one of those holiday destinations that seems perfectly designed for a driving holiday. The roads in Spain are generally well maintained, there are some major motorways connecting the key cities, and a lot of the driving is long stretches of flat countryside. One of the best points to start your Spanish expedition is by campervan hire in Bilbao. A lot of ferries from Europe dock into Bilbao plus there are also regular flight connections from all the major airports. An hour to the east by Bilbao motorhome rental, San Sebastian is a beachside city and a joy to visit. Surfing or sunbathing by day, exploring the narrow streets of the old city by night, snacking on ‘pintxos’ and drinking beer, are some of the locals’ major pastimes. There is a tremendous upbeat vibe about this place, making it impossible not to fall under its spell. If you still have energy to spare, pitch your campervan rental in Bilbao in the sandy beaches of Zaraua and Zumaia, a handy destination for day trips by camper hire in Bilbao. For the best seafood on this side of the Bay, head to the fishing harbor of Getaria. About two hours by motorhome hire in Bilbao and farther to the east is Saint-Jean-Pied-de-Port or ‘Saint John at the foot of the mountain pass.’ This is a picturesque old town just on the French side of the Pyrenees mountains. Local restaurants serve up traditional Basque cuisine and the stone buildings and narrow streets transport you back to a medieval time so leave your Bilbao campervan hire to a campground nearby and leisurely explore the town on foot. This is also the starting point for the Camino Frances – the most popular section of the Camino de Santiago, an ancient pilgrimage route. 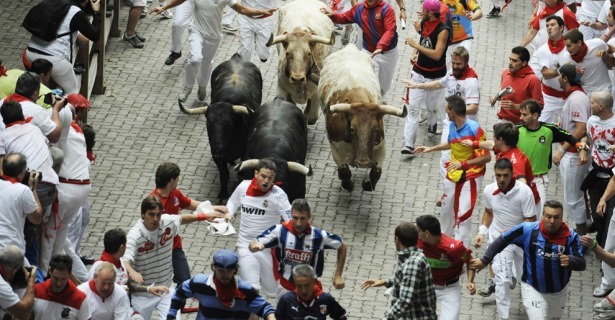 A couple of hours southeast by Bilbao motorhome rental is the venue for the Festival of San Fermin, otherwise popularly known as the Running of the Bulls. For much of its history, Pamplona has been a fortified town – a strategic point in the ever changing military fortunes of this area. As modern warfare evolved, its fortified walls became obsolete and they were destroyed which enabled the city to grow and modernize. The heart of the old city remains intact though and is fascinating to explore on foot. The Basque Country is a fascinating little corner of the world and an area of unique cultural significance that is well worth exploring by motorhome rental, campervan hire or RV rentals. If a long pilgrim walk isn’t really the sort of holiday that you were imagining then getting your adventure started with a motorhome hire in Bilbao will set you up for a holiday of a lifetime and an experience that you won’t forget.